So yes, I watched Ekstra. I will not be caught dead watching the other Star Cinema movies which are usually formulaic to the point of gag-inducing; but this was an indie film and an award-winning one at that. I wanted to see what the fuss was all about. But naturally, before the movie began, there was an annoying group of noisy Vilmanians at the back happily chatting away. In fairness, they hushed down when John Estrada and Randy Santiago came on for the anti-camcording ad. For an indie film, Ekstra’s cast is quite impressive. Vilma Santos, as everyone knows, is in the lead role whatever she has said in talk shows about being an extra for the first time in her career. Focal to the telling of the story, of course, is none other but Ate Vi. 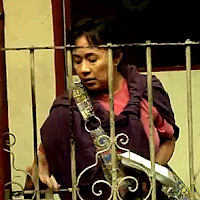 She probably does not give as swashbuckling a performance as she did in, say, ‘Anak.’ That said, Ate Vi is Ate Vi. She is a master in the craft of acting without acting which, in my opinion, makes her among the most gifted and convincing actors in the country. The movie takes a while to get started; and I, for one, seriously thought about hopping over to the next cinema for Percy Jackson. I mean, why does the audience have to sit through Loida – as played by Ate Vi – stumbling around the kitchen heating water for a morning bath before an out-of-town gig? That scene takes, like, forever; and is about nothing more significant than waiting for the water to boil. I am reminded of the Brilliante Mendoza classic ‘Serbis,’ which had the camera on several occasions following characters while they ascended three flights of stairs to the top floor. I mean, the lack of editing is insulting to the intelligence. Once Loida and his fellow ‘talents’ are on the road and on location somewhere in Batangas – if at all – Ekstra comes alive. There are no wicked twists and thick plots and subplots. The story is simple and told in a straightforward manner. It is about a day in the life of an extra – a bit player. Of course, within the course of that day, one learns about the hopes and aspirations of the bit player; the economics of the trade that each player has so struggle with; and even instances of discrimination on location between the bit players and the major stars. While in a manner of speaking Ekstra’s story is thematically heavy – as, indeed, it is a social commentary – it is nonetheless told in a pleasant and humorous manner. The audience will guffaw many times through the movie as the characters accurately portray the humour with which Filipinos go through daily living in whatever the situation. But Ekstra is not comedy. Instead, it is a sad story told humourously. This is what makes the movie not merely watchable but downright enjoyable – once the storytelling starts to pick up, of course. It gives the viewer a very believable and insightful look at life behind the cameras. Ekstra purports to show the behind the scenes of the making of soap operas. It may well be the same for the making of motion pictures. Most of us are only ever privileged to see the finished product. Anyone who sees Ekstra will never look at the nameless people in the background or those who deliver one-liners with the same eyes again. Because of this, Ekstra will have achieved its goal to shift attention – if momentarily – away from the major stars and into the nameless people who comprise the background. Inevitably, there are lose ends. For instance, a lost cellular phone which is not quite resolved nor does it have any real significance to the story. There is also this part showing an extra being made up with prosthetics which, apart from attempting to portray the difficulty of putting the prosthetics on, does not really have any significance to the story, either. Probably because of the need to tone down on the production costs, not a lot of attention is paid to lighting or camera framing and angling. Ekstra does not shine in the strictly aesthetic and technical sense. But then again, it is an indie movie. That said, it flourishes in the acting department. All the main players give natural and believable performances. Watching the movie will be like being there on the set as well, feeling the pain and fatigue of the bit player but also enjoying the laughter and the sense of camaraderie that the behind the scenes closeness fosters. As Loida, she uplifts those who we invariably ignore when we turn on the television to watch a soap opera or go to the cinema to see a movie. The extra is faceless no more. Acknowledgment: Photos captured from the official Ekstra trailer on Youtube.